"I don't want to see a pretty dancer, I want to see Polina dancing." Oscilloscope Labs has debuted a trailer for a dance film titled Polina, telling the story of a classically trained ballet dancer who decides to switch to contemporary dance. This decisions "throws everything into question on a profound level", taking her on a journey of discovery and understanding. This is a full-on dance film through and through, made by two filmmakers with an extensive background in dance. Anastasia Shevtsova, a professional dancer who has performed with Saint Petersburg’s Mariinsky Theatre, stars as Polina. The cast includes Niels Schneider, Jeremie Belingard, and Juliette Binoche, who has danced with London-based choreographer Akram Khan. This looks very kinetic and unique, taking dance and the commitment involved to a whole other level. Rigorously trained from an early age by a perfectionist instructor, Polina (Anastasia Shevtsova) is a promising classical ballet dancer. She is just about to join the prestigious Bolshoi Ballet when she discovers contemporary dance, a revelation that throws everything into question on a profound level. Diverting from her plan, she leaves all her exacting preparation behind and moves to France to work with famous choreographer Liria Elsaj (played by Academy Award®-winner Juliette Binoche, who has danced with London-based dancer/choreographer Akram Khan). Once there, Polina is quickly forced to grapple with the realization that determination and hard work don't always lead to success. 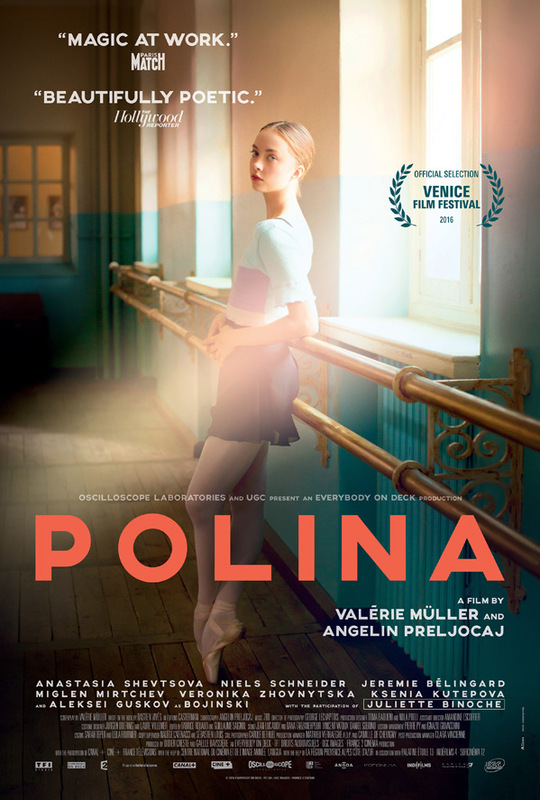 Polina is directed by filmmakers Valérie Müller and Angelin Preljocaj (Snow White), both with backgrounds in dance. The screenplay is written by Valérie Müller, based on Bastien Vivès' graphic novel. This first premiered at the Venice Film Festival last year. Oscilloscope Labs will release Polina in select theaters starting August 25th.